So as we were coming into the home stretch for the release of the new cycle of my web series “Fury of Solace,” I started kicking around the idea of starting a behind-the-scenes blog. I wanted to give people an opportunity to peek behind the curtain, but I didn’t want to break the fourth wall by posting that kind of material on furyofsolace.com proper. But after chatting with transmedia guru Jeff Gomez at Wyrd Con last month, it quickly became clear that what I really needed to do was start a transmedia blog. For one thing, I’ve partaken in more transmedia projects than just “Fury of Solace,” and they bear discussion as well. Aside from that, keeping a travelogue of my “Fury of Solace” journey here is the perfect way to make it a relevant transmedia case study regardless of how many views my indie series manages to rack up. Now, the term “transmedia” means a lot of things to a lot of different people. So much so that I know many people who aren’t particularly fond of the term, who see it as a buzzword that isn’t necessarily an apt description of what we do. I try to stay out of those arguments, only because I don’t think we get to coin these terms as individuals: a thing is what it comes to be called, and the metrics of that are bigger than all of us. But since this is my blog, the least I can do is explain what transmedia means to me. Generally speaking, when I talk about transmedia, I’m referring to the use of social media immersion and/or alternate reality games as part and parcel to a storytelling experience. You’ll note, I did not say to “enhance” or “supplement” a storytelling experience. While those descriptors still technically constitute a transmedia experience, I tend to think that it serves no one to engage in it purely as a marketing afterthought or simply to latch on to the cross-platform zeitgeist, such as it is. In fact, that’s the difference between using transmedia as a marketing ploy and true transmedia storytelling: the latter actually requires a story. And a great side-effect of a transmedia story well told is it can operate as organic marketing in and of itself. But we’ll get into the nuts and bolts of all that in the weeks and months to come. For now, I’ll simply say: Welcome to Coefficient of Fiction! I’m planning to update this about once a week, every Wednesday. Though I’ll be posting two entries this week, because I want to focus next week’s post on “Fury of Solace,” to coincide with the launch of our new cycle next week, and I’d like to slip a discussion of the “Dark Knight” transmedia campaign in before that happens. 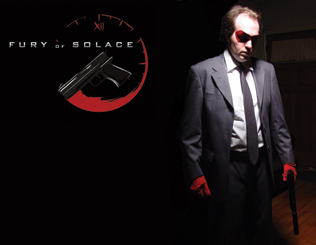 So stay tuned for that entry tomorrow, watch for new “Fury of Solace” episodes starting on Monday, July 30th, and come back here every week for more musings on transmedia! Very exciting! Further evidence that Marshall McLuhan said a mouthful when he proclaimed “the medium is the message”. Or is it now “the media are the message”?